1. Remember all actions are judged by Sensei Garriss. It is your job to set a good example but not to discipline others unless directed to. 2. Disrespect in any form will not be tolerated. Reduction of rank, probation, or dismissal from class temporary or permanently are some of the forms of discipline. All disciplinary actions will be at the discretion of Sensei Garriss. Everyone is welcome to discuss concerns with Sensei Garriss outside of training time. 3. Social talking during formal classes is not allowed unless directed by the instructor. Open workouts will allow for social discussions. 5. Frequent bathroom visits are not allowed during class time unless there is a medical reason. 6. Water breaks are given during difficult workouts however infrequent breaks are allowed if student respectifully bows out. 7. Food and Drinks are not allowed on the training floor. At times, if a long workout is in progress such as a workshop, the instructor may adapt class as appropriate. 8. Visitors in the viewing/waiting area should keep talking at a low volume so that students are not distracted. 9. Cell phones should be silenced or off during class time by students; visitors may put phones on vibrate. 1. Rei when you enter or leave the Dojo. 2. Rei when you enter or leave the training floor. 3. Class begins and ends with a rei toward the instructor. 4. When class starts, an additional rei will be performed toward all other black belts. 5. 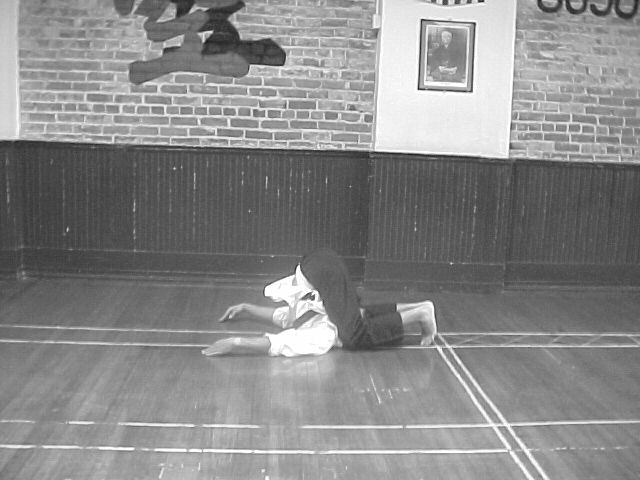 Face inside the Dojo training floor when bowing. 6. Look up when you Rei anytime we engage in or simulate combat. 7. Look down when you Rei for respect as in a handshake to show trust. 8. When working with a partner Rei when you begin and end. 9. A respectful bow should last at least 2 seconds. 6. Martial Arts Gi/uniform, approved karate shirt, all white top, all red top, all black top, and any comfortable appropriate pants or shorts allowed; inappropriate may include but is not limited to skin revealing or printed clothing. 7. All offensive tatoos will be covered.